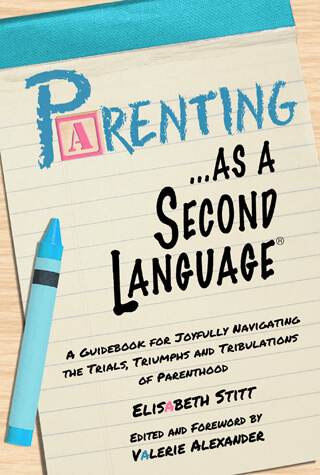 Reading Parenting…As a Second Language is like chatting with a wise, compassionate woman who’s experienced every aspect of being a parent. It’s more like a conversation than listening to simple advice. The author, Elisabeth Stitt, happens to be one of the most knowledgeable voices among parenting coaches and counselors. So what she has to say is grounded in an awareness of what works. Each chapter delivers practical wisdom about a game-changing parenting issue. Topics are treated in an informal, conversational style, as if listening to a friendly, experienced coach. Each chapter contains examples and stories from the author’s personal experience, recommendations, and exercises to reinforce her points. My favorite is Chapter 8, which is about consequences. This is one thing every parent has to get right, and it’s all too easy to get it wrong. The key is to articulate – in advance – what the consequences will be for violating what’s most important to the parent. Then communicate these to the child. And of course, following through. All this is far more difficult than it sounds, but if not done well, control of child behavior breaks down. Stitt gives us the best how-to treatment I’ve ever seen. Another favorite is Chapter 9, which focuses on empathy. They say a parent’s love is the key ingredient in raising a child, but how much expressed love can there be without this key element – empathy? Her recommendation for expressing empathy is to use active listening, absolutely the most effective approach. She gives numerous examples of how to express empathy this way. And once again, her advice is totally on-target, the best treatment of this all-important topic I’ve ever read. My 5-star recommendation: I believe every parent should read and reread this book while working through the challenges of preparing their kids for life. I also have a new book: How Your Teen Can Grow a Smarter Brain.